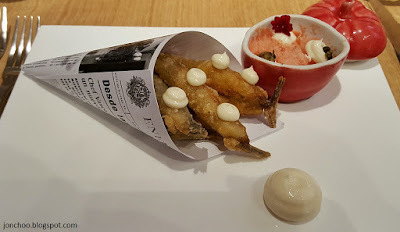 For mains we had a cod bizkaina, a stew consisting of cod tripe in bizkaina sauce and deep-fried cod bites, and roasted Iberico presa. The cod stew was delicious, but slightly overpowering. In hindsight, the stew, as sort of a comfort food, we think is best ordered in colder days. 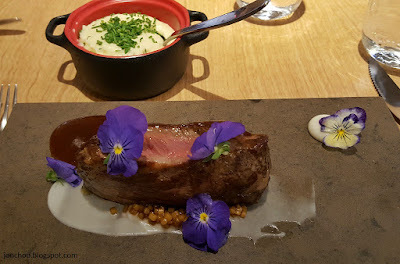 The roasted Iberico presa on the other hand was a stand out dish. Pink in the middle, the pork was deliciously soft. The desserts are on a trolley for diners to choose from. 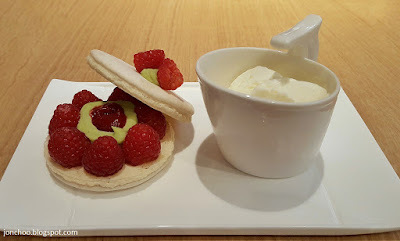 We had a Basque vanilla pudding and raspberry macaroon with basil ganache. All deserts are served with Basque vanilla soft ice-cream. We truly enjoyed our dinner at Eneko at One Aldwych. Staffs were also friendly at all times. Even discounting the 50% off deal, the food wasn't pricey for the quality. Oh, about that 50% off deal again - it is valid throughout the month of August as they go through their soft opening phase. 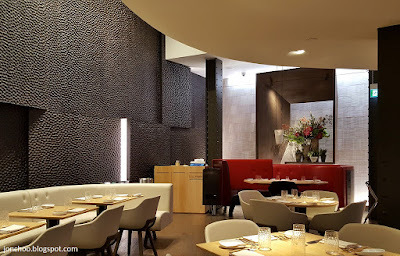 So if you ever wanted to dine in a restaurant owned by a triple Michelin chef without breaking the bank, this is it.